For most of the 18th-20th centuries, government bonds usually behaved like a risky asset. When equity prices fell, bond yields rose, i.e. bond and equity returns were positively correlated (bond prices move inversely to yields). 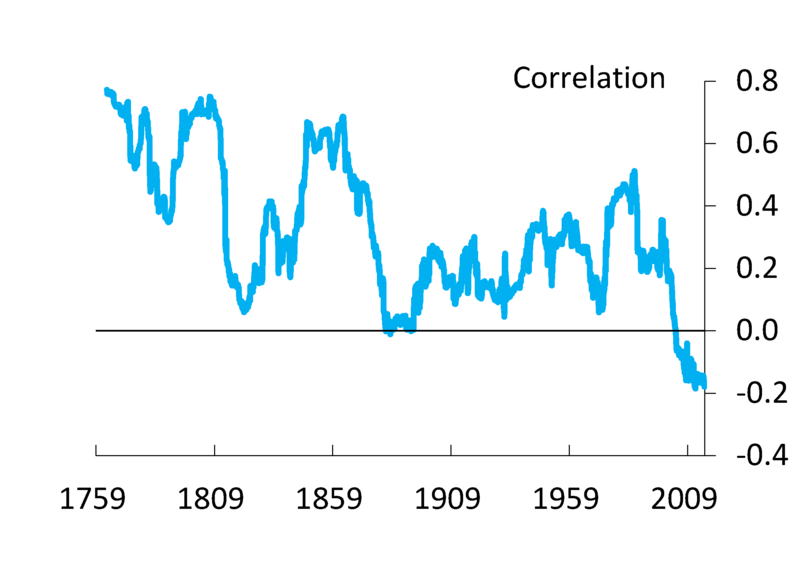 But since the mid-2000s, bond and equity returns have been negatively correlated, i.e. bonds became a hedge for risk. Before this, the last time this correlation was near zero for a prolonged period was the long depression in the late 19th century. Source: Thomas and Dimsdale (2016) and author calculations. Line shows ten year trailing correlation of monthly returns. The change in the bond-equity correlation since the mid-2000s partly reflects investors being less worried about inflation risks. As well as demand-type shocks being more prevalent than supply-type shocks, the introduction of credible inflation targeting has helped anchor inflation expectations and reduced the likelihood of high inflation risks. Investors may also have become more focussed on bad states of the world. At the same time, there has been a structural increase in demand for ‘safe assets’, with more investors demanding safe government bonds for reasons unrelated to their expected cashflows. This has been exacerbated during and since the financial crisis, with deterioration in risk sentiment leading to episodic ‘flight to safety’. And the addition of QE and forward guidance to the monetary policy toolbox may mean long-term bonds react differently to previously. Matt Roberts-Sklar works in the Bank’s Macro Financial Analysis Division. Stocks and bonds are both up tremendously since 2009. Seems like they are highly correlated for the last 7 years, other than during the brief flights to bonds (during stock market corrections). Really good graph though ! !